While your oven is preheating, the first thing you’ll want to do is brush a 13×9 pan liberally with butter. You don’t have to flour the pan if you don’t want to, but you do definitely need to butter it. Once done, put the 2 sticks of butter in a small sauce pan over very low heat. Now zest your lemon. You can easily do that with a regular box grater. The little rasp-like side that is useless for almost everything on your box grater? That’s for zesting citrus! If you don’t have a box grater with a rasp side, use the smallest holes you can on a regular grater (most have 2 sizes these days). If you only have the one “regular” size option on your grater, you can use that and mince the zest with a knife like you would garlic. Whichever you use, make sure you only grate the yellow part and not the bitter white pith beneath. Set the zest aside and cut the lemon in half around the equator (the middle, not end to end) and squeeze the juice out of it over a strainer set over a bowl to catch the seeds. Set the juice aside. Keep an eye on your butter while you’re doing this so that it doesn’t burn. Once it’s melted, take it off the heat and continue with your lemon. Then your wet ingredients + half of the lemon zest (but not the butter yet), making sure to measure out only enough lemon juice to satisfy the recipe- some of the rest will be for the glaze or frosting you’ll need. I’ll get to that later. 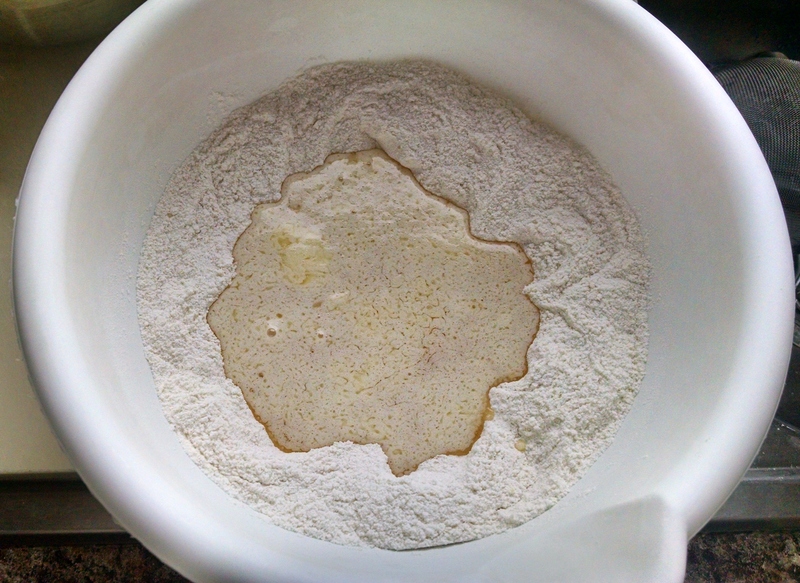 Once you have that done, pour the butter into the flour mixture and mix it in. 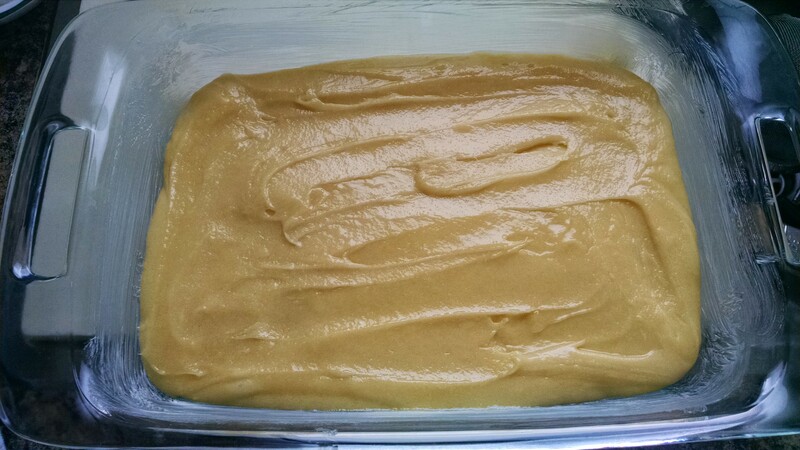 The batter will be very stiff and you don’t have to get it completely mixed. Once you’re at this stage add the rest of the ingredients (giving them a whisking with a fork first!) and mix thoroughly. Make sure it’s completely mixed and smooth, but don’t try to whip the ingredients like a cake. 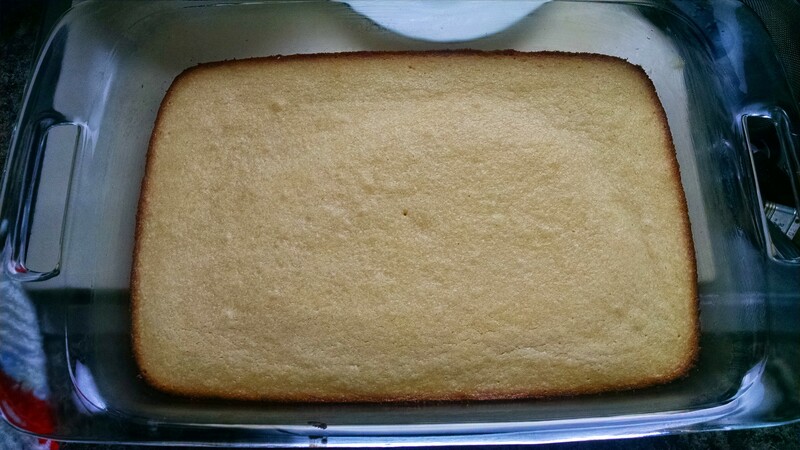 These are the lemon equivalent of dense, chewy brownies so the batter is going to be very heavy. These now go in the oven until the bottom and edges are beginning to brown and the center is set. You should be able to insert a toothpick in the center and have it come out clean when they are done. You have 2 choices now: cover these in a delightful lemon glaze or spread on a wonderfully smooth lemon cream cheese frosting. I’ll include the recipe for both below. But you have to cover these with something; they won’t be very good and they will dry out terribly if you don’t. Despite being similar in texture, these are very different from brownies- you can’t just leave them plain. *Generously butter the bottom and sides of a 13×9 inch pan. Flouring the pan as well is optional. *In a small saucepan, melt the butter over low heat. Once completely melted, remove from the heat and let sit. *Zest the lemon as fine as possible and set aside. *Cut the lemon in half short-ways (around the equator) and squeeze well to get as much juice as possible. Set the juice aside. *In a large bowl, combine the dry ingredients and mix well. *In a small bowl, whisk together the wet ingredients; including 1 teaspoon (or roughly half) of the lemon zest. 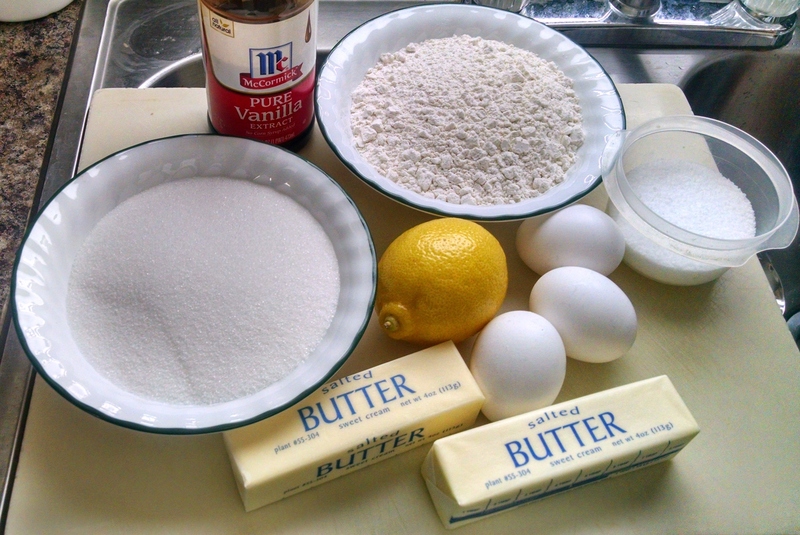 *Mix the melted butter into the dry ingredients until mostly combined. *Add the wet ingredients and mix until smooth. *Pour the batter into the prepared pan and bake 30-40 minutes or until set. *Remove from the oven and cool completely before glazing or frosting. 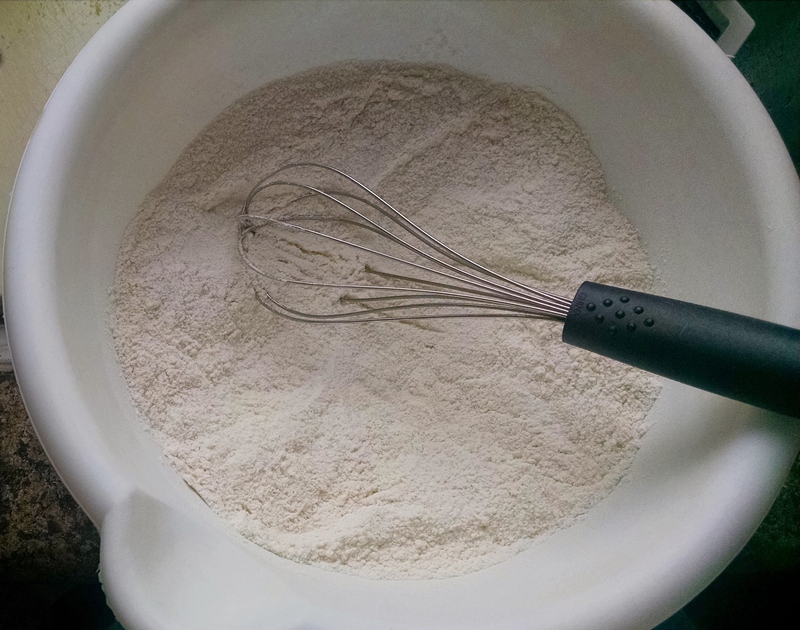 *In a bowl, add the wet ingredients to the powdered sugar and stir until completely smooth. *Spread over completely cooled bars. *In a stand mixer or with a hand held mixer beat cream cheese and butter until fluffy & lightened. *Add lemon juice & zest and mix well. *Gradually add the powdered sugar and mix very well. *Spread over the top of the completely cooled bars. As you know, I much prefer to use real food (“whole”, “natural”, etc) ingredients when I cook and bake. I try to stay away from processed foods as much as I can, but sometimes the classics are based on foods that are not really good for you. Take pecan pie, for example. One of the main ingredients is corn syrup. Granted; it’s not as bad as high fructose corn syrup (which is ultra processed- WAY more than regular corn syrup), but it’s still definitely not a health food. In fact, my mom can’t eat anything with corn syrup in it without getting a bad headache. 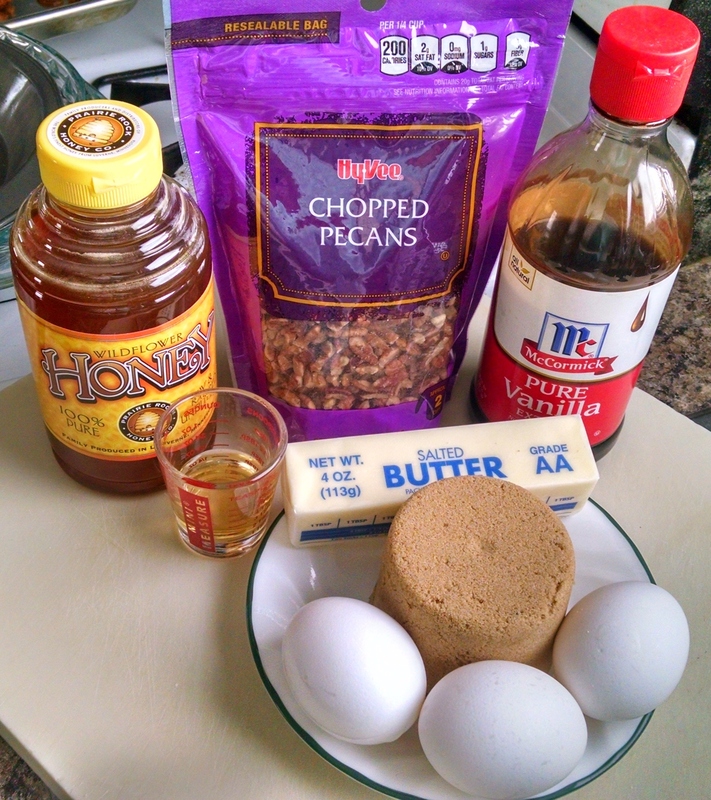 So for Thanksgiving last year I set out in search of a recipe for pecan pie that doesn’t use corn syrup. I found several that use honey instead. Score! 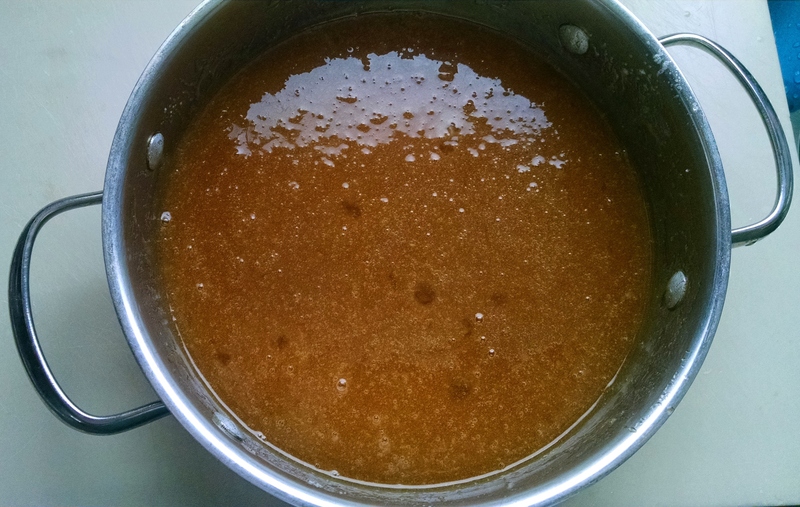 Honey is most definitely a health food, and you can use it in place of corn syrup in many recipes (but there will need to be other adjustments to the recipe too, so don’t just start swapping honey for corn syrup willy nilly). So I played around with combining some of the recipes and this is the result. My mom LOVES it and no one who’s tried it so far dislikes it. If you’re using salted butter like I am here, you won’t need extra salt. If you use unsalted butter (which is what most recipes call for) you’ll need to add a little salt to the filling. You’ll notice, I’m sure, that I don’t have a pie crust pictured. You’ll need one, but the method you use to procure one I’ll leave to you. I used a refrigerated just-roll-it-out-in-the-pan crust from the store. By all means; if you want to make your own, please do! I didn’t because I don’t have anyplace to roll out a pie crust. The great thing about making your own pie crust is that you can make the pie any size you want. You can do a full pie or you can use a muffin tin or individual tart pans to make tiny pies. Either way, it’s up to you. First you’ll need to melt your butter. 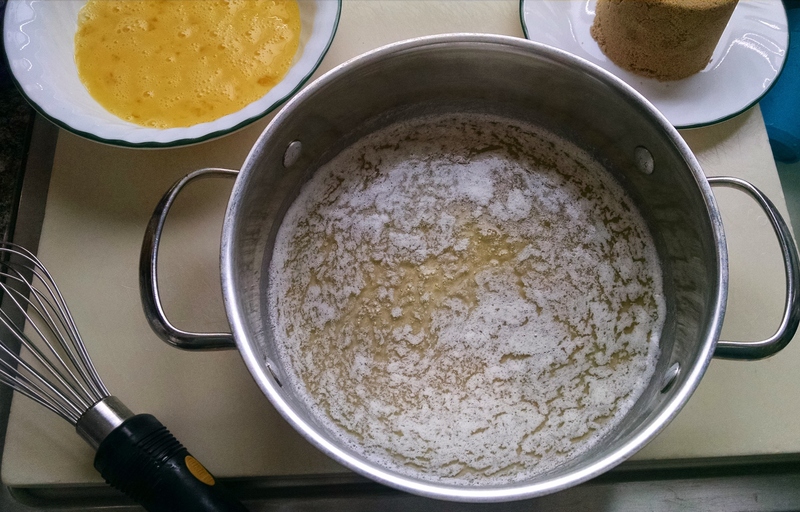 Put the butter in a medium sized saucepan over very low heat. Once the butter is just melted, take the pan off the heat and let it sit for a little while; long enough for the butter to cool slightly. 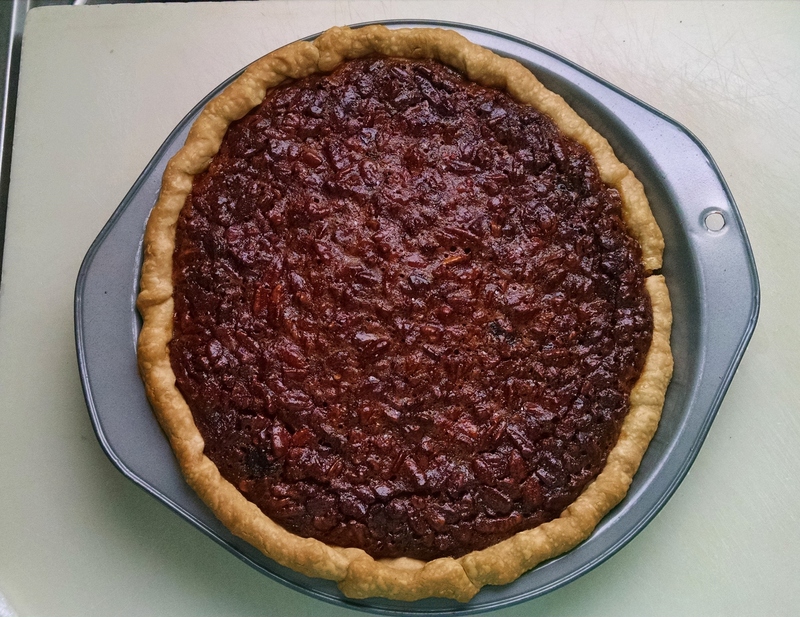 Most recipes call for whole pecans to be laid out nicely in the bottom of the crust. I don’t do that. One reason is that whole pecans are crazy expensive. Stupidly expensive. 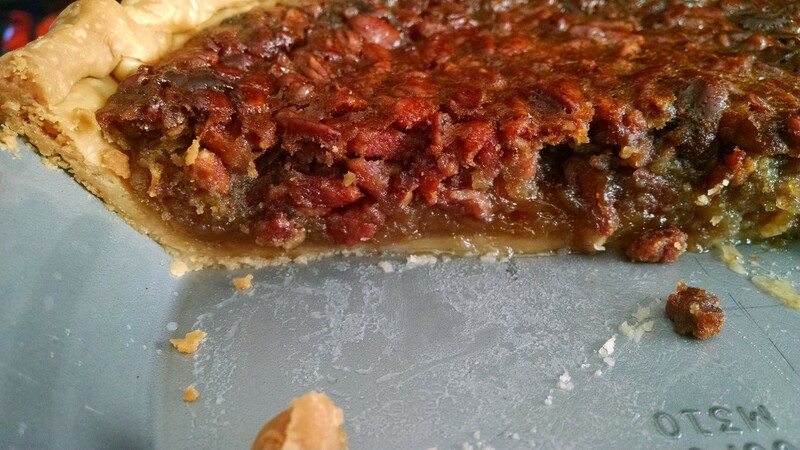 Another reason is the trouble I have cutting a pie that uses whole pecans. The pecans tend to just squish down and make a mess out of the filling. So I use chopped pecans and they work just fine. 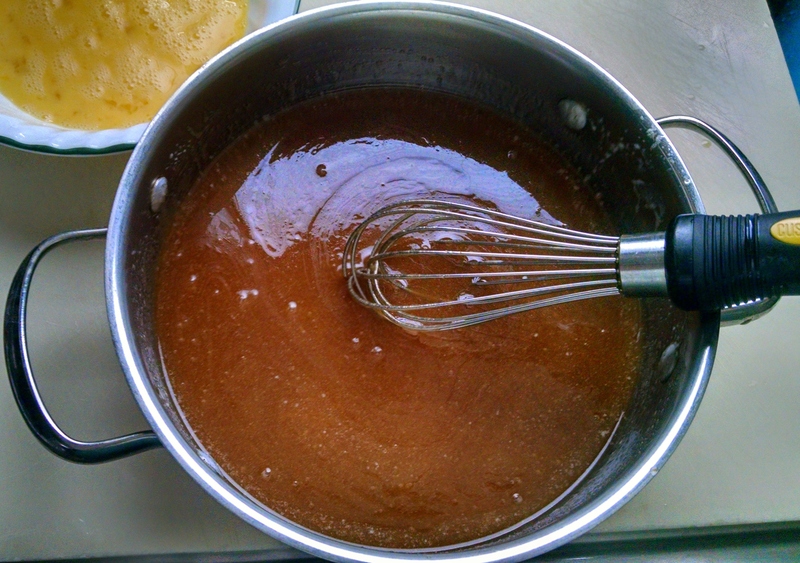 Next, add the brown sugar, honey, vinegar, vanilla, and salt (if you need it) to the butter. Whisk all of that together very well. 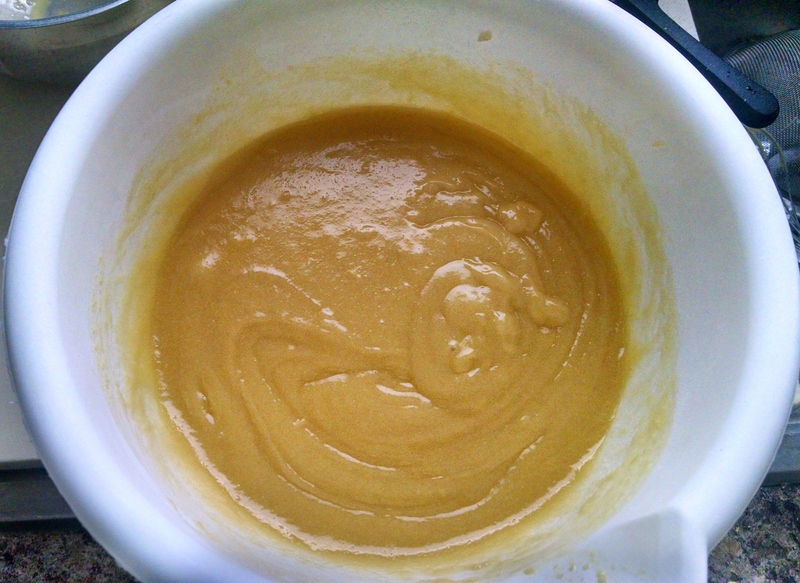 It will take a little mixing to get everything incorporated into the butter- that’s a lot of butter. Yep. Bubbles. Little bubbles coming to the surface as the gaps between the pecan pieces are filled. But they’re nothing to worry about. You can try to jiggle the pan a bit to get rid of them, but you don’t need to. The pecans will float to the surface as the pie bakes and the bubbles will dissipate then. Time to go in the oven! Place this on a foil lined cookie sheet so that if the pie overflows the pan will catch it (which I’ve never had happen, but better safe than scrubbing charred sugar off the bottom of your oven) and bake for 45-60 minutes, until the center is set. It shouldn’t jiggle when you shake the pan gently. Ok, so my pie isn’t perfect. The crust on the right side there wasn’t pressed to the side of the pan correctly, so it shrank down a bit. Not a huge deal. The huge deal is that this pie almost burned. I should have taken it out of the oven about 3 minutes before I did. I missed the timer when it sounded. I’m lucky I walked through the kitchen when I did. So keep an eye on the timer and make sure you choose a loud one! Anyway, I managed to save my pie and not have to make another. One of the problems I’ve noticed with pies that substitute another ingredient for corn syrup is that the filling is runnier than it should be. As you can see, that isn’t a problem with this recipe! The center looks a little runny, but really that’s just where I pushed the filling in with a knife to cut the pie (which would have been much worse had I used whole pecans). 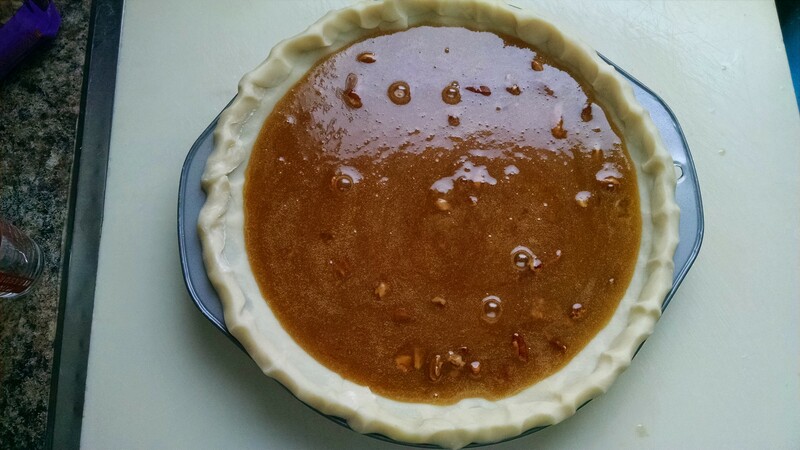 This recipe really is the best I’ve found for pecan pie- period. The flavor is amazing and not sickeningly sweet like the corn syrup recipes out there. The texture is heavenly! And it’s made using one of nature’s super foods- how much better could it get?! *Prepare pie pan or plate with the unbaked crust. *Melt butter in a saucepan over low heat. *Once melted, remove from heat and add the next 5 ingredients. 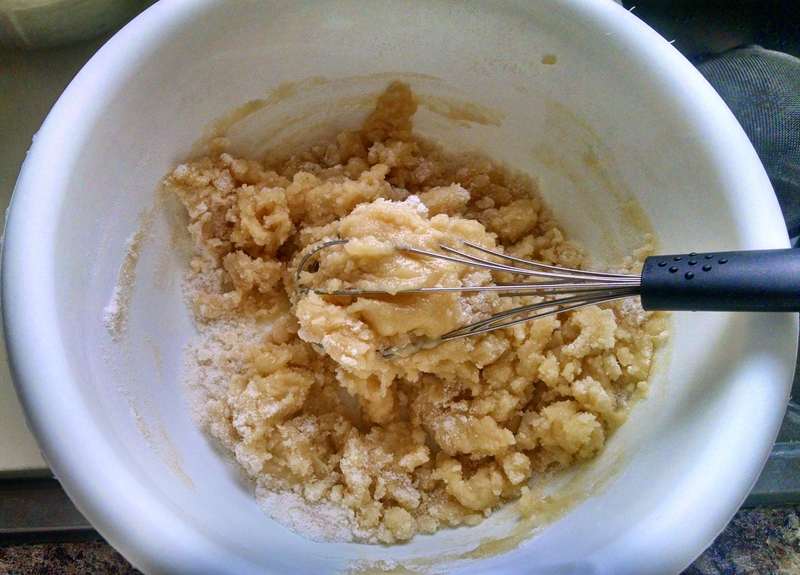 *Whisk well, incorporating the butter into the other ingredients. 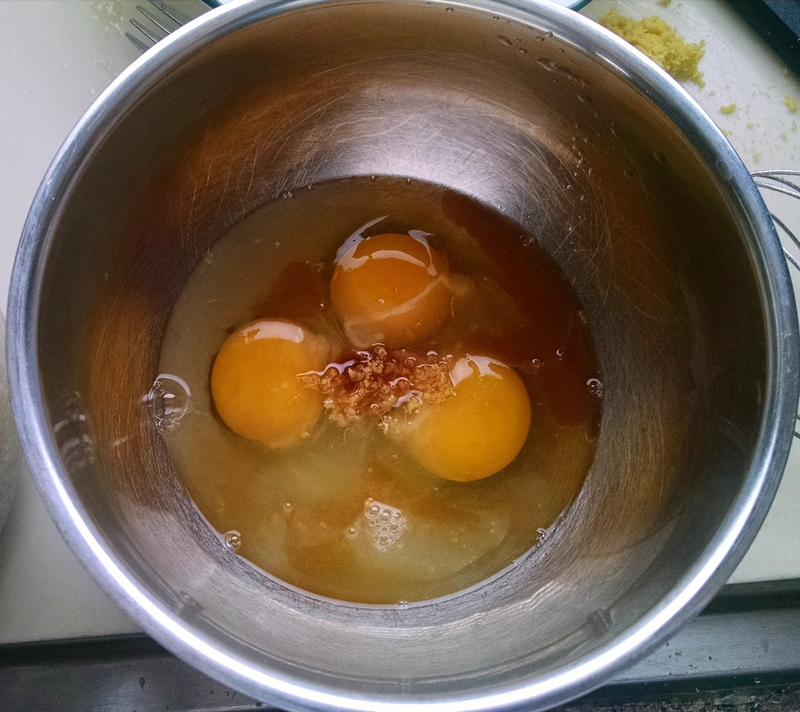 *Add the eggs and whisk very well. 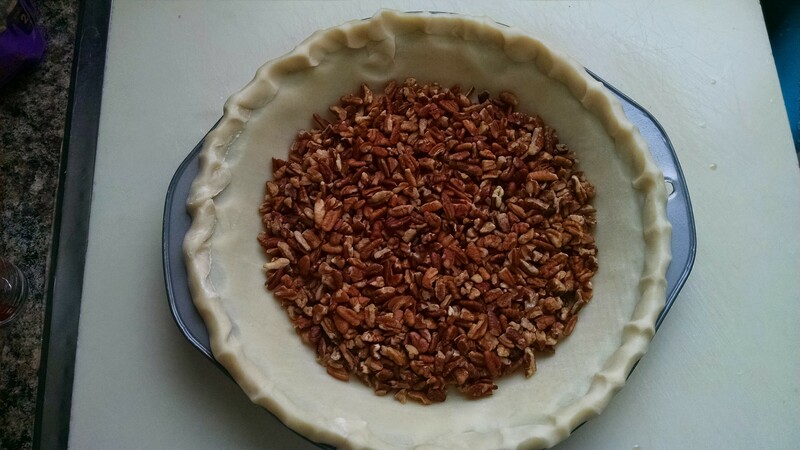 *Pour the pecans into the pie crust so that they cover the entire bottom. *Gently pour the filling over the pecans, scraping the saucepan to get all of the filling you can. *Bake the pie for 45-60 minutes; until the pie is set in the center. *Let cool completely before slicing, but chilling is not necessary. If having something that has eggs in it left on the counter and not in the fridge bothers you, you can go ahead & refrigerate it. But I left this pie out for 4 days before finishing the last piece and I didn’t even have a hint of tummy trouble. There’s so much sugar and fat in the filling that spoilage isn’t an issue for quite some time. I’ve Added a New Feature!